Mores Creek Summit Backcountry Skiing: Mores Creek Summit Blog: New Goodies for 2017 Winter! Mores Creek Summit Blog: New Goodies for 2017 Winter! When you access the Mores Creek Summit blog at morescreeksummit.com you might have notice the new look for this winter. But that was not the only change to the blog. 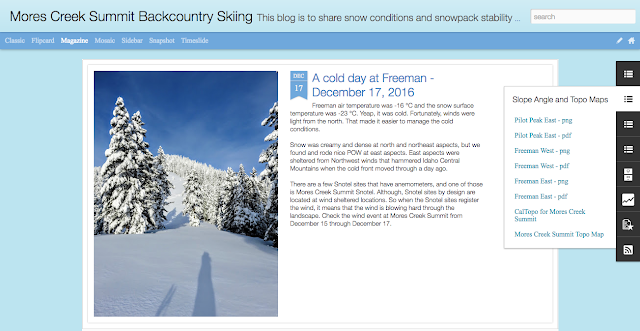 The blog sidebar on the right has a collection of new goodies meant to help backcountry tourers with the information they require before heading out to ride the backcountry. The sidebar has a selection for the temperature, the wind, air relative humidity, and solar radiation measured at the top of Pilot Peak (8142 feet). The sidebar selection for Pilot Peak Summit data is shown in the screen capture included below. This information is useful during the planning an outing at MCS (Mores Creek Summit). Furthermore, is essential for tracking weather condition impacting the development of the snowpack. The map selection on the sidebar has been updated with new maps for MCS. There are two versions, *.pdf and *.png. 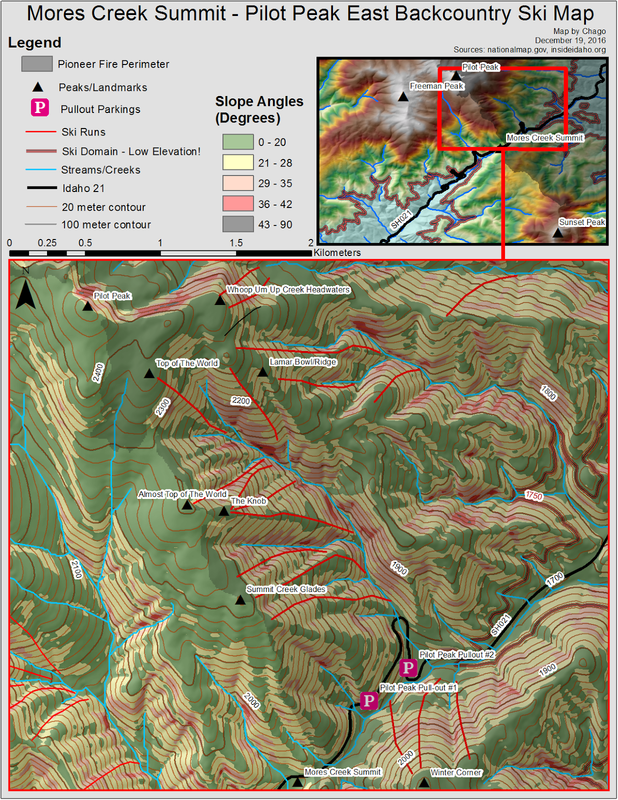 The maps have slope angles that help in visualizing where to place uphill tracks and where potential avalanche terrain might exist during periods of instability. Below the map for Pilot Peak East ridge. REMEMBER, a topographical map will NEVER replace measuring angles with a phone slope app or a clinometer at the slope we intend to ride. Notice that the maps have elevation, contour lines, and distance are in meters. These new maps show runs I like to ride with my family and friends at three general areas; East Freeman, West Freeman, and Pilot Peak. These maps are NOT meant to be a catalog of all the ski terrain at MCS! In addition, a link for CalTopo maps is provided. The provided link will zoom into MCS and show slope angles as well as topographical information in feet. The original set of topo maps for MCS generated a few years ago are still there, at the bottom of the selection in the sidebar. 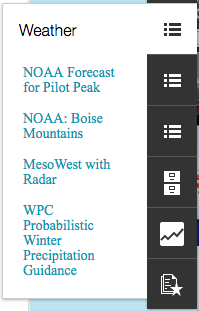 Another valuable goodie added to the sidebar are Weather resources for Pilot Peak and Boise Mountains. One of my favorites is the probabilistic interface to get the probability of snow for a period of 72 hours. 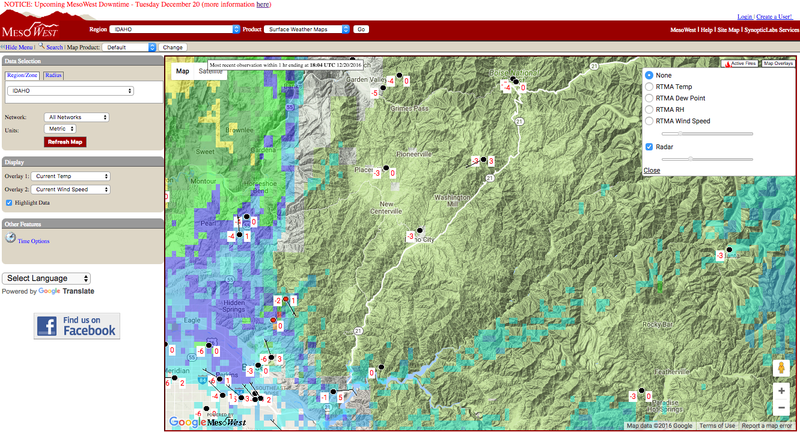 There is also a link for MesoWest, where weather stations in Idaho are displayed. 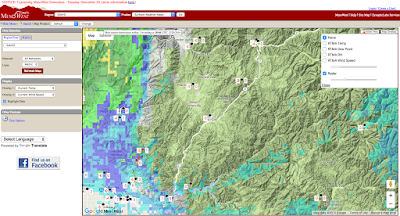 I suggest configuring this site with an overlay of the southwestern Idaho weather radar, as shown below. There are other useful overlays, such as temp and winds, that allow us to gain insights about weather patterns. 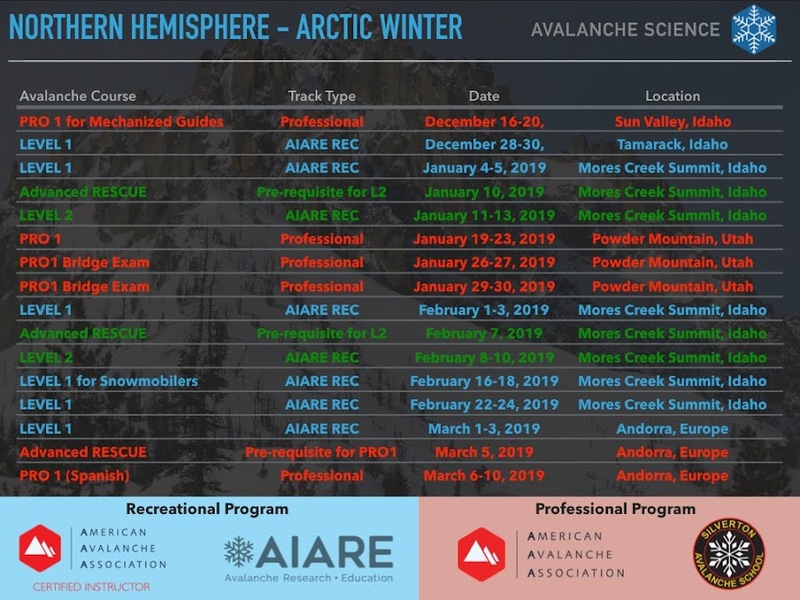 The all familiar links for Southwestern Idaho Snotel Stations and nearby avalanche centers are also available in the sidebar. We will continue to add new maps and tools to the blog during this winter, so keep visiting the blog. Dec 8-10 Storm - Let it SNOW!